Pocket Digital Thermometer - Texas Brewing Inc. 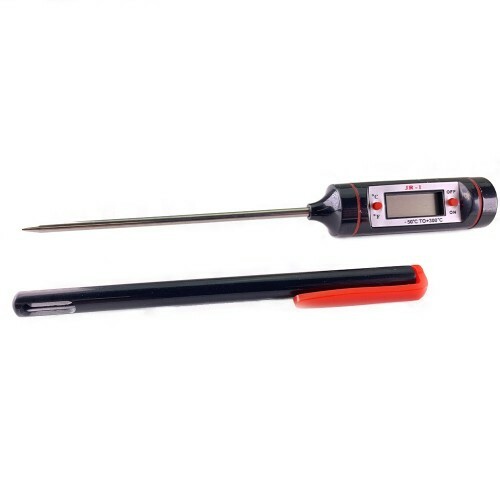 This digital pocket thermometer has a stainless steel sensor probe to ensure accurate results. The range of the thermometer is -58ºF to +572ºF (-50ºC to +300ºC). I bought this recently to take spot measurements in my mash. The unit itself is compact and the storage sleeve is nice. The numbers are easily readable at low temperatures (more on this below). There are two buttons that are easily reachable with the fingers of the hand that is holding the unit. One of the buttons turns the unit on and the other converts the reading between Celsius and Fahrenheit. I checked the unit's calibration in a teapot of water set to a roiling boil. The temperature read 215.2 F. I noticed that if the head got too close to the steam coming off the teapot then the LCD display got a little funky with the numbers and then just turned black. When the unit is removed and cooled, the readings returned to normal. 215.2 is within one and a half percent accuracy. I can not find a way to calibrate the readings on this unit to get it closer to 212 but I figure it is accurate enough for what I need. The display does take a little while to show the temp - it is not an instant read type thermometer. However, with a little patience, I found id okay for my mash.